I was finally able to join a MakTrav (Makiling Traverse) climb last ID12 2010 . There were two instances in the past I planned to join the climb to this mountain but due to untoward and unexpected incidents I had to backed out. Mt. Makiling will always remain close to my heart since this was my first climb at the tender age of 16. This was my first time of doing the traverse of Makiling. The jump-off starts at Barangay San Miguel in Sto. Tomas Batangas. The trail starts in a rough road that gives you a grand view of Makiling from the Batangas side. Then you need to make a turn to a dry river bed.This is the place where all the hikers get lost. We also got lost that we asked help from some locals who were harvesting mangoes. It seems that the trail is forever changing and adapting defending on the season. Most of the succeeding trails are fully covered by trees. Except for some parts where cugon-an are present (and reforestation is happening). There is also a hut halfway where you can rest and refill your water rations. The first destination is Peak3, where almost all of the assault climb are present. But there are stationed ropes to help you a bit on the climb. A majestic view of makiling can be seen on this part of the trail. The view is so beautiful that some climber compares these to Avatars Pandora (but there is no Navi species :P). Upon reaching peak3, we took our lunch. After Peak3 the next destination is peak2, the trail is a mossy forest where there are several fallen logs and narrow paths for a climber to get through.It must have been harder for our American friend who is tallest one among the group because we had to go through low-hanging branches and fallen trees . Also its a good thing its still the end part of summer, and there were few limatiks (tropical leech) on the trail. Or else I think this place would be very infested, and since the trail is narrow there was no way you can avoid leaves and branches touching you, the place where the limatiks attacks their victim. Upon reaching peak2 the trail was now on a descent. This is traditional trail that will lead you to UP Los Banos exit (with regard to the traditional trail click here). 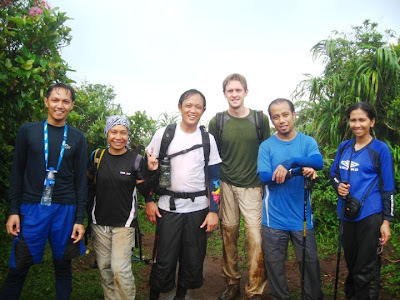 Except on the early part where its muddy and slippery, the traditional trail is very easy but is very long. I learned that from peak2 to UPLB its roughly 9KM. We arrived in the forrest ranger post at 7PM. We hiked for 11 hours! After cleaning up, we had our dinner then head back going to Manila. As far as I know there is no effective repellant against limatiks. I read from a blog that this hiker once soaked his clothes in tobacco that it made him the less vulnerable from limatik attacks among the group. The most effective way is to be not so scared of them, treat them maybe just like ants. What I can advise you is how to properly removed them. Use a liguid spray filled will alcohol or diluted salt. In any case, I dont think there will be lots of limatiks in makiling since it almost summer (not like my first blog).